Is Your Good Dog Fat? When I was at the vet’s last week I got some shocking news. I had gained weight. Luckily it was only a pound but still, it made me think. 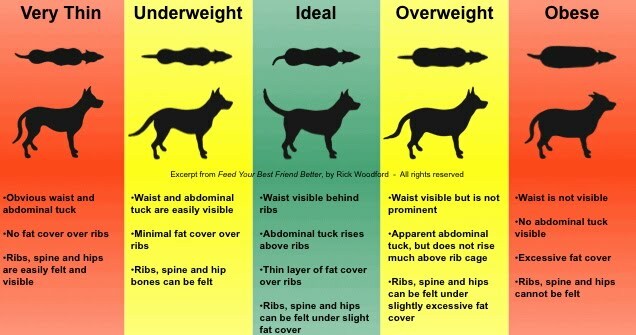 Did you know that approximately 1/3 of dogs & cats in the United States & Canada are overweight? What is surprising is that many people are happy with the look of their chubby dog or cat. But just like humans, obesity is a bad thing in dogs. Obese dogs are at a higher risk of developing diseases such as arthritis, diabetes, & cancer. In addition, depending on the breed, carrying extra weight can cause spinal & joint issues. A healthy diet & regular exercise is very important for dogs. Between meal snacks should be avoided. As much as it may be a bonding exercise, sharing your chips or candies is really not a good idea. Have regular feeding & exercise schedules for your good dog & stick to them. Choose a good quality dog food, the cheaper brands have a lot of filler & too many calories. Below is a chart showing different body sizes from too skinny to obese. Eat healthy, exercise daily. Treats but not snacks. A long & happy life is your reward.